Video Production: Can Movie Tricks Be Used For Corporate Video Marketing Online? 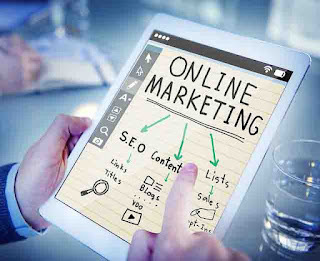 Can Movie Tricks Be Used For Corporate Video Marketing Online? Corporate video production has mostly been seen as far from movies and cinematic style as can be. In the past corporate video used for online marketing has very much had a "corporate"style. This style, although updated with graphics and other styling, has stayed very similar to past productions. High end advertising and commercial broadcast video productions have however been using movie techniques for a long while.These have been out of reach for most corporate video productions. The reason is that the advanced moving camera shots require expensive equipment. Some of the equipment used by movie makers to create the cinematic look include such things as a dolly, a jib crane, and aerial vehicles such as helicopters, aeroplanes and high powered UAV or drones. 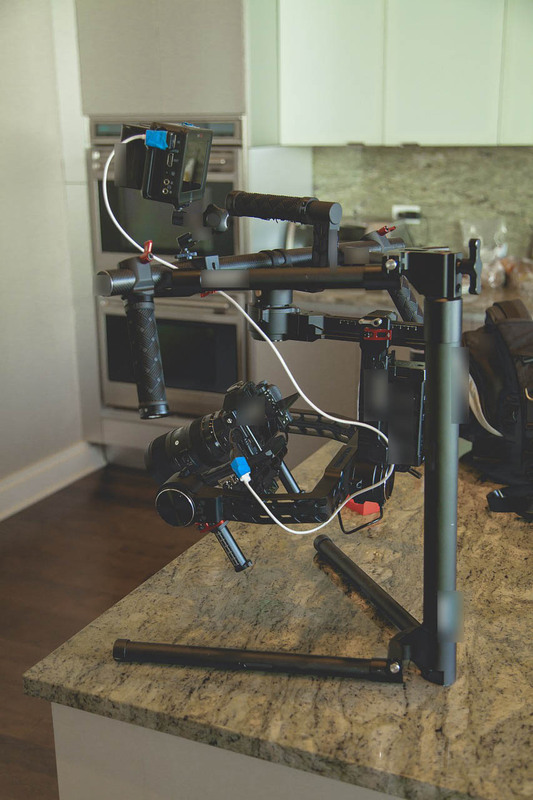 These pieces of equipment are very expensive and mostly out of the reach of low budget movie makers and, more importantly for this discussion, of corporate video production companies in Johannesburg who need to produce low budget corporate video productions. Over time though cheaper replacements have become available to smaller productions. Although they are not as effective, in many ways are effective enough, to be usable and not be noticed as a substantial difference. 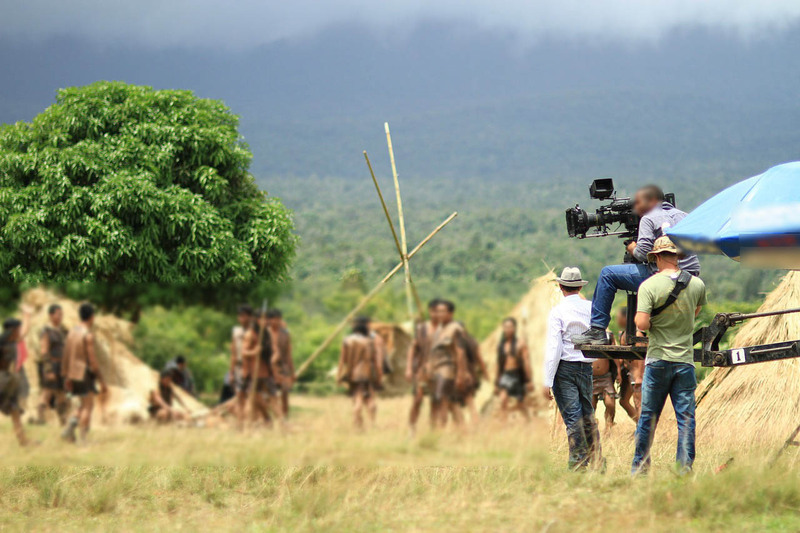 The most important impact is that low budget corporate video productions now have access to equipment to recreate cinematic shots in what would normally be a very plain video production. So to see how this works and how to take advantage of the new equipment we will look at these replacements. Dollys replaced with with sliders and dolly wheels. A dolly is a type of moving camera stand where the movement is in a lateral motion in a way that is smooth and stable. The movement is only in a side to side smooth movement. It can also be used in a forward or backwards movement as well but only in a horizontal way. 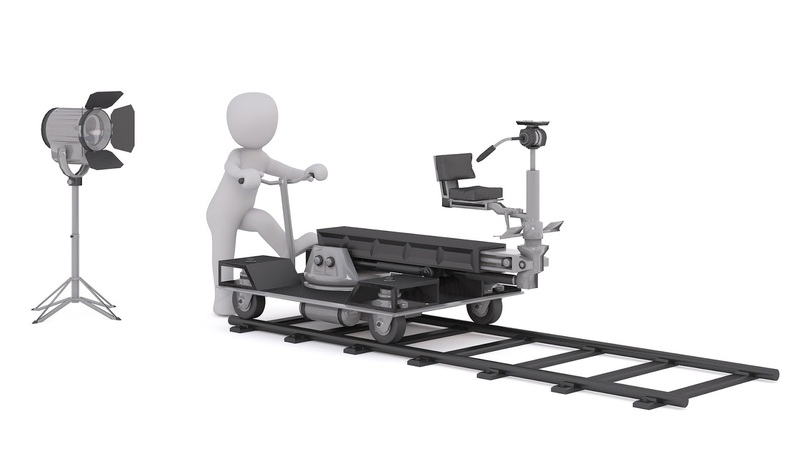 These can be either a stand only for the camera or include a seat for the camera operator and would need another person to push the dolly along. The slider and tripod dolly wheels. These are much cheaper and able to do similar movements. 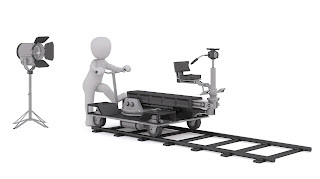 Many would argue that a slider is nothing like a dolly because of its limited movement range. This may be the case but many dolly movements can be simulated with a slider and can actually do movements not possible with a dolly, which is to do very small movements for very close shots of smaller objects.There is also a cheaper replacement for the dolly which is a set of wheels which simply clip onto the camera tripod.These don't need an extra person to push the camera stand around but does need a very smooth surface to work on whereas a dolly can work on almost any surface. In offices or factories where most corporate video productions take place, where the floors are smooth, these can be perfect replacements. Steady cam replaced with image stabilisers. The steady cam was a creation of a camera operator and engineer who made it specifically for a movie called "The Shining" and was then used in the movie "Rocky". These movies required a camera operator to follow an actor along an undulating surface and up and down stairs without shaking the camera. This system includes a combination or springs, arms and weights. It is a heavy piece of equipment that has to be attached to the camera operators body. The lower cost replacement is the camera stabilisers. The mechanical version is very effective and quite cheap.It uses a basic vertical arm with a weight at the bottom.It is light weight and very effective but takes a very long time to set up perfectly and takes a lot of practice to use correctly.There is a higher priced piece of equipment and that is the gimbal. This is an electronic camera stabiliser. It is also a reasonably heavy piece of equipment and with its higher price does put it more into the film industry range. It also behaves very differently to the mechanical camera stabilisers in that it corrects movement very quickly which makes some movements not possible.Others however love the accuracy of the gimbal. It is still cheaper than some steady cam designs but not cheap enough for low budget corporate videos.One reasonably new addition is actually in the camera and not as a seperate piece of equipment.That is the built in image stabiliser in the camera body or the lens. Combined with other equipment like a mechanical stabilizer or a jib can produce spectacular results. Jib Crane with mini jib. While there doesn't seem to be a difference between a Crane Jib and a mini jib, there is a huge difference in price and the convenience of use is vastly different. A jib crane used in the film industry often requires at least one additional operator besides the camera operator. The equipment is also a much more difficult to move and often require permits and have many safety rules and regulations that the mini jibs don't have. A mini jib, because of its size and weight can often be packed out easily and into a bag or back pack and can be moved from one location to another making it much more cost effective for video production companies to move from one set to another.The difference, except for the extremely high angle shots, are almost indistinguishable between the crane and mini jib shot. The price difference though is dramatic. The full crane Jib can be in the tens or hundreds of thousands of dollars while most mini jibs range from just a few hundred dollars to as low as tens of dollars if are home made. The shots created are so spectacular that this should be seen as a required piece of equipment for almost all corporate video production. Aerial shots with quadcopters or mini drones. A helicopter is pretty obvious to most but most people don't know how the video camera use can vary. Some would assume that the camera is always mounted onto the helicopter but there is in fact a high percentage of film productions where the camera operator is simply seated in the helicopter with an open door or special window.The use of helicopters is prohibitively expensive and, in may cases, pointless because of the noise, dust blown up and legal and insurance issues. 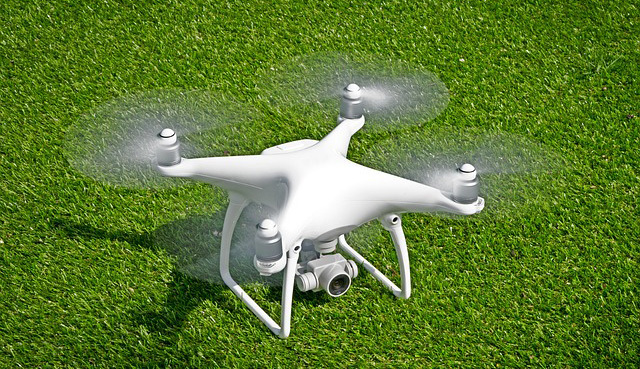 The film industry moved to high powered drones or UAV (Unmanned Aerial Vehicle) . These although cheaper than helicopters are still way too expensive for corporate video productions. This is where the quadcopter or mini drone came in.Its relatively cheap, very effective and easy to use for most shots. The problem for most drone operators though is the varying regulations for use from one country to another. Video production companies in Pretoria, for example, need to use a licensed drone operators and can only do shots in certain ways, whereas in many other places in the world no license is required or may just be completely illegal. When they can be used effectively drones have been some of the biggest game changers in video production equipment. Some beginner videographers have gone from doing basic shoots to epic corporate marketing videos. Finally, not as a piece of physical equipment but in the world of software, many video editing software programs allow a video editor to fake camera movement as if it were done by physical equipment. In many other ways the software can also clean up the footage that was made with cheaper camera equipment to make it look like more expensive equipment was used such as image stabilisation as well as all the special effects that movie studios use. The result of all these changes and additions of cheaper equipment have meant that corporate video productions can suddenly become as thrilling as big budget film or advertising productions. Production companies in Johannesburg who were stuck with a camera on a tripod can now change to creating spectacular visually appealing shots for their corporate clients without bringing in the insane budget. While many video production companies will stay stuck in their old ways of thinking, pioneering spirited video creators will now be able to produce videos which effects similar to big budget movies. While this will add some extra cost, the results so far out reach standard productions that ignoring them would be silly. Here is an example of how a standard corporate budget can be used to turn a standard marketing video into a fun and exciting one.